March 4, 2015 November 30, 2016 by Kelly M, posted in Databases, Nonfiction, Research Help! If you want to find out an overview of a topic, where do you go? Many people try Wikipedia first. It has a lot of information. Now what if you need an overview of a topic but would like one you could cite for a paper? That’s where our research starters come in. They are shorter than Wikipedia entries but can still get you started. The sources are usually from encyclopedias, as well. 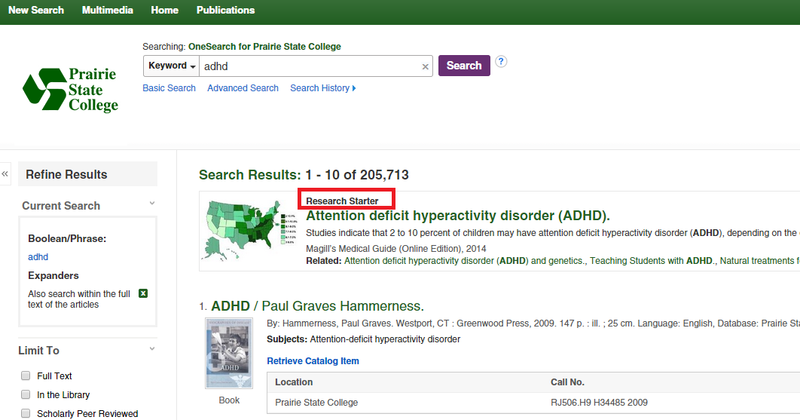 For example, let’s say I go to library.prairiestate.edu and type adhd in the search box. I get 205,000+ results, but the top one before the numbered ones says Research Starter. Now I can click where it says “Attention deficit hyperactivity disorder (ADHD)” and read approximately five pages about ADHD. It comes from Magill’s Medical Guide, a quality source. At the bottom of the research starter it lists a bibliography that you can also use including sources from the DSM-5 and the National Institute of Mental Health (NIMH). There are more than 62,000 research starters (1), so your topic has a great chance of having its own research starter. I’ve found them for microeconomics, wicca, the sinking of the Lusitania, zebras, the solar system, cloning, and more. (1) Enis, Matt. “Industry: EDS Research Starters Debuts.” Library Journal 139.5 (2014): 22. Professional Development Collection. Web. 27 Feb. 2015.